Formula 1 fans are welcomed to voice their opinions about the sport in global fan survey. MONACO – (May 21, 2015) – The Grand Prix Drivers’ Association (GPDA) and Motorsport.com have joined forces to enable followers of the FIA Formula 1 World Championship to voice their opinions about the sport in an in-depth global fan survey. Now online at gpda.motorsport.com, the survey is open to all fans of Formula 1 to give their thoughts on the sport they love. It comprises 50 questions on all aspects of F1, and is aimed at all types of fan – from armchair enthusiasts to committed race-goers. The GPDA is the independent association of active Formula 1 drivers, formed in 1961, that has previously focused primarily on safety issues in the sport. 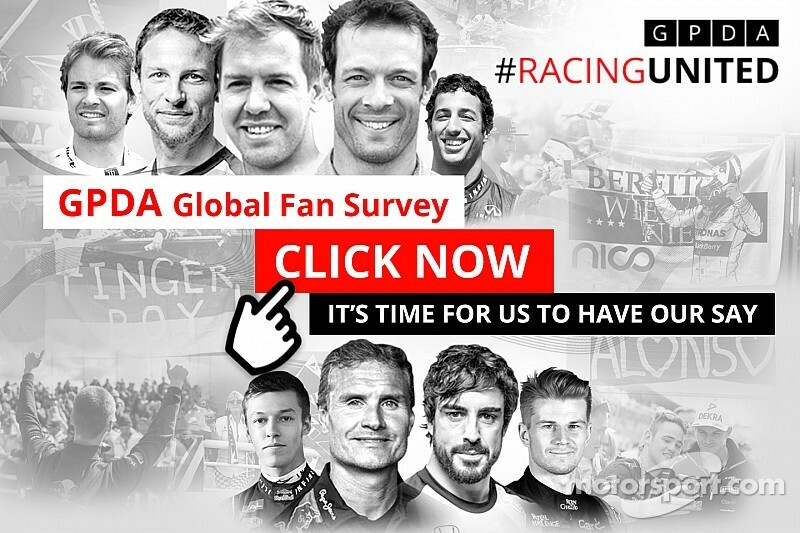 It has chosen Motorsport.com’s unique international network to deliver this survey in 12 languages, and forms an integral part of its #RACINGUNITED community campaign. “As F1 drivers we share a passion and deep love for our sport with our fans,” said GPDA Chairman Alex Wurz. “We want to give every F1 fan the opportunity to share that passion and for us to understand what they really think about us and our sport. The partnership is the latest exciting development in the Motorsport.com portfolio, which has expanded its global network rapidly in 2015 with more plans in the pipeline. “There is no better partner for a global F1 fan survey than the stars of the show themselves: the drivers,” said Motorsport.com’s Editor in Chief Charles Bradley. “The driving force behind this initiative is to allow fans of the sport to have their say. The fans are the true consumers of what happens both on and off the track, and their views haven’t really been listened to in recent years. The gpda.motorsport.com global fan survey will be online for two weeks, and headline results will be available from July. Formed in 1994, Motorsport.com is an international network of online motor sports content, multi-national platforms, world-class digital distribution, video and interactive multimedia worldwide. Powered by passion and fueled by award-winning, cutting-edge technology, our One Team, One World approach to motorsports content is staffed 24 hours a day, seven days a week and is updated continuously throughout the day. Headquartered in Miami, Florida, and in bureaus around the world, our 2015 global expansion will include entries in 14 countries in 10 different languages.